OK, for those dying to know, the song is called “Bruises” by a band from Brooklyn called Chairlift. And now let me explain why Chairlift is likely the happiest band in the music industry right now. Aspiring musicians used to dream about getting their songs on the radio, making the big break, so to speak. Get out on the airwaves, and your career is all but guaranteed. If DJs got behind your songs (usually because of bribes from record companies — but that’s a discussion for another day), then radio listeners would get behind your song as well, and sells of your album would really take off. 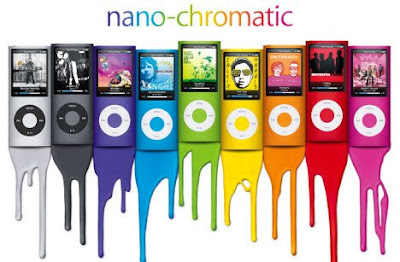 Nowadays it seems like the best way to launch a music career is to license your song for a commercial, and more specifically for an iPod commercial. If the hipsters over at TBWA Chiat Day, the ad agency with the Apple account, like your new undiscovered song, you might be fortunate enough to have a bunch of silhouetted dancers movin’ and groovin’ to it on national television. Is there anything cooler than these spots on TV right now? I don’t think so. And Apple has been running the campaign for four years or so. That, my friend, is an accomplishment. “Cool” is such a fleeting thing. Cool today. Uncool tomorrow. Or better said, uncool five minutes later. And yet, after all these years and with little variation in the campaign, Apple has maintained its place at the top of the cool food chain. Partly because the product continues to reinvent itself and become slicker and smarter all the time. And partly because of good old fashion product advertising. And why do the ads work so well? Well, I can’t explain it other then to say that “they’re just cool, okay?” Spastic people performing back-breaking spins, splits, kicks, and twists is both inhuman and inhumanly cool. There’s no other way to describe it. Recently however, the spots have taken a turn. Instead of dancing people, we have dancing iPods, so to speak. They float into (or are placed on) the screen, spinning and twisting and flying inward with the music. It’s beautiful and elegant and thanks to the infectious song by Chairlift, downright mesmerizing. And that’s the simple genius behind Apple’s advertising strategy: when you’ve got a beautiful, amazing product, show your beautiful amazing product. You don’t need a pitchman. You don’t need smoke in mirrors or a talking monkey or any other advertising trick. You just allow the product to speak and wow for itself. The bottom line: download this song. It has sweet, whimsical lyrics and a melody that sticks in your brain. Worth the 99 cents it cost to download it at iTunes? You betcha. And that, dear reader, is why Chairlift is the happiest band in the business at present. The song’s popularity rating at iTunes is at its highest. Everyone and his brother is downloading this song. And an obscure band that wasn’t even on the music buyer’s radar is now beeping and blipping like a fast approaching aircraft. To be sure, it’s also well worth the 89 cents (and no DRM) it costs to download it at Amazon, too.